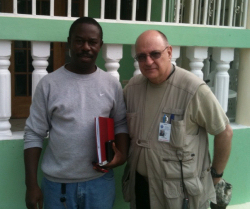 Chaplain Fair with Mayor of Fort Liberte, Haiti on a civilian mission. Chaplain/Major Fair sometimes puts on different hats, he is also a Major and Chaplin with the Texas State Guard. Chaplain/Major Fair TXSG Chaplain, of Brownwood, Texas is in Haiti on a civilian mission known as “The Hope for Haiti Medical Mission” which is comprised of medical personnel from the Brownwood area. Chaplain Fair said “his TXSG training and the real world experience when activated with the TXSG in his role as Chaplain during Hurricanes IKE and DOLLY, helped prepare him for this mission in Haiti”. The Chaplain further indicated after seeing the destruction and suffering, he feels that Texas is blessed with having a dedicated group like the TXSG who stand ready assist their fellow Texans in time of need. The military personnel of the TXSG give of their time, money and yes sweat to train and train hard to be prepared to live up to the TXSG motto “Texans Serving Texas”. An article Chaplain Fair authored for the America Psychotherapy Association magazine can be accessed by clicking here.